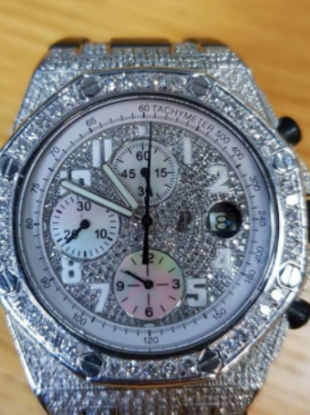 Diamond Rolex watch CAB seized last year. THE CRIMINAL ASSETS Bureau (CAB) returned over €4.3 million to the public coffers last year, according to its annual report due to be released today. Over €2.37 million was collected under Revenue legislation, an increase on last year’s €2.1 million. A total of €1.69 million was recovered using laws to seize assets which gardaí believe have been acquired using criminal means. This is an increase on 2016 figures of €1.4 million. There were 28 new proceeds of crime cases brought before the High Court – the largest number of new cases in a single year. Other highlights of the report include that €320,000 was recovered in social welfare overpayments. The value of assets frozen by CAB during the year amount to €7.02 million. Taxes and interest demanded by the organisation were valued at €14 million. This is the twenty-second annual report of the Bureau since its establishment in 1996. It was set up following the murder of journalist Veronica Guerin and tasked with targeting assets which derive directly or indirectly from criminal conduct. Last year, CAB won its Supreme Court case to allow it to sell three properties, including Jessbrook Equestrian Centre, which were formerly owned by convicted drug dealer John Gilligan. An appeal by Gilligan against the seizure of three properties was unanimously struck out, 21 years after the State first took control of some of his assets. Email “The Criminal Assets Bureau returned over €4.3 million to the State last year”. Feedback on “The Criminal Assets Bureau returned over €4.3 million to the State last year”.